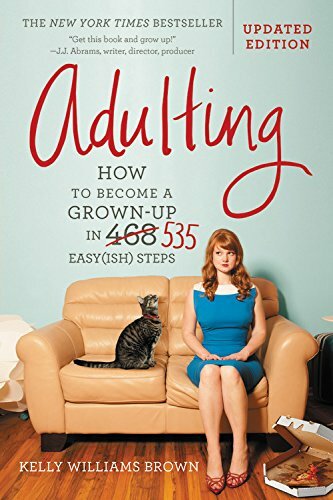 • I have written a New York Times-bestselling book called Adulting: How to Become A Grown-Up in 535 Easy(ish) Steps, now in a convenient and updated second edition! It covers things like how bleach works, what one says in a condolence note and how not to sleep with your co-workers. • It is out now, courtesy of Grand Central Publishing, and has been translated into seven languages. • It has been covered in/on The New York Times, The Today Show, The Wall Street Journal, Cosmopolitan, Grazia UK, Publisher's Weekly, Vogue and Portland Monthly, among others. Click here for press coverage. • If you would like to cover it, the press contact is Caitlin Mulrooney-Lyski at caitlin.mulrooney-lyski@hbgusa.com. • You should definitely purchase it here, here, here or here. • In the meantime, you should check out the companion blog, because of course there is a blog. A neglected blog, but a blog nonetheless. If you graduated from college but still feel like a student . . . if you wear a business suit to job interviews but pajamas to the grocery store . . . if you have your own apartment but no idea how to cook or clean . . . it's OK. But it doesn't have to be this way. How to avoid hooking up with anyone in your office--Imagine your coworkers having plastic, featureless doll crotches. It helps. The secret to finding a mechanic you love--Or, more realistically, one that will not rob you blind.